This large, edge-on galaxy is no friend of man-made light sources. It was not difficult to find, but was still rather subtle from my back yard. It appeared as a slender, soft brightening of the sky and shared space with one rather distracting star. This star was located on the west side of the north spine of the galaxy. The glow from the star overpowered the galaxy on the north side enough to make it look lopsided at a glance–like the south spine was bulkier. Perhaps when observing from a darker site, the galaxy’s luminosity would be able to hold its own against the background sky glow and that star would not seem to interfere as much. Another faint star marked the southwest tip of the galaxy’s profile. I analyzed the field for some time, to see if I could detect the central dust lane, but only got a couple fleeting hints of it. I wasn’t confident enough in those glimpses to record it in the sketch. Once again, a darker sky would probably help in that effort. The galaxy appeared to be about 15 x 2 arc minutes in size and aligned at a PA of about 40 degrees. That doesn’t match well with the published value of 22 degrees–it looks like I marked my west point a bit further clockwise than it actually was. This is a very good sketch of this famous edge-on galaxy. I especially enjoyed your narrative and it explains why I can’t detect even a hint of this one using a 10″ scope from my site. I wonder, if it is possible to see the dusty edge in 8″ scope. Even on very dark sky! The sketch and story 🙂 are very good. 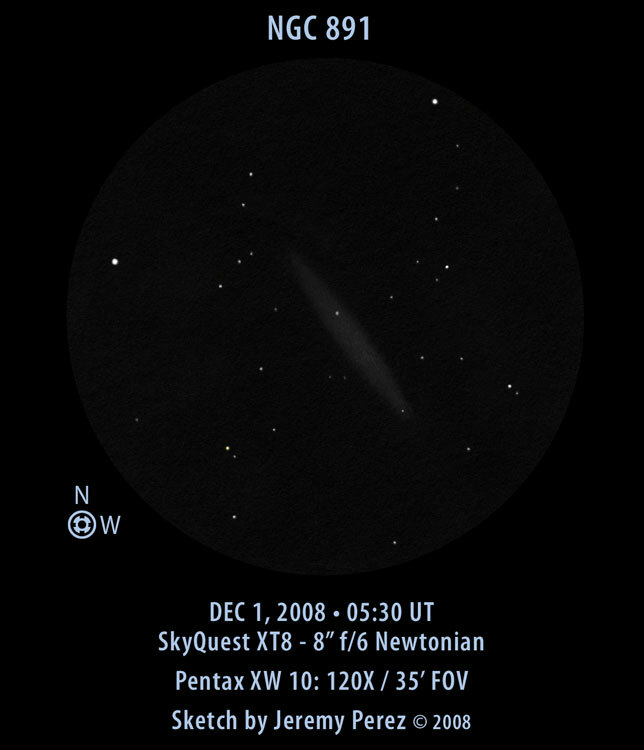 The dust band should be visible from a darker sky in an 8 inch–Eric Graff noted that he observed it with his 6 inch Parks Astrolight from a dark site. It’s on my list of objects to observe again under better conditions. Thanks for info. I have to hunt for it.